We took our Porsche 911 Turbo S on this fabulous event and confirm it is running very well! The sound from the circling seagulls, in the elegant town of St Mawes, situated in the bay area off the river Fal, was replaced by the muffled beat and sonorous roar from 25 eclectic sports cars, starting their engines in readiness, on 2 May, for the seventh year running, of the St Mawes Classic Car Festival. Their opposition was from a 7 Litre Cobra V8, of Charles Good, the Ferrari V12 250MM of Nick Mason, and the Ferrari 250 Nembo Spyder of John Lewis, as well as an assortment of 6 in-line engines, from a 3 1/2 L Bentley, two E types namely a V 12 and 4.2, and an XK 120 Jaguar FHC 3.4 of Philip Salt. 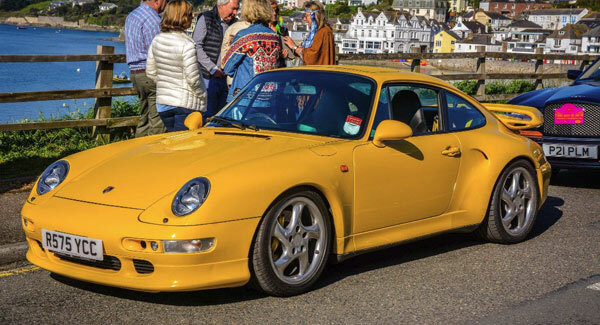 The Porsche 911 Turbo S, in AA speed yellow, later proved to be an appropriate colour, as Pozner rescued Annette Mason from a long walk, up a steep hill on Lands End, when the regulator proved faulty on Nick's 250 MM Ferrari, after a fascinating scheduled visit to the Telegraph museum, where communication was first made across the Atlantic. Further distinguished opposition came from a 1950 Fraser Nash Le Mans Replica, belonging to Karen Richards, the wife of David Richards, who was driving an Aston Martin DB6 Volante. Also in this superb assortment of yesterday machinery, was the Triumph Stag of Mark and Amanda Sater, as well as two Morgans, Richard Plant and the all girls team of m/s Williams and Horton. A Bentley Continental GT speed represented the millennium, owned by Richard And Gail Smith, together with on an Aston Martin V8 Vantage, of David Wright. Tim and Amelia Whitaker have devised a unique Cornwall Car tour of a small group consisting normally of 25 cars, on a drive of southern Cornwall over three days for the last seven years, with each year themed and centred around a particular aspect of Cornwall. The first day this year was an introductory talk and a chance to explore the Telegraph Museum, before departing for Porthcurno and Sennen Cove, for an excellent lunch at Ben Tunnicliffe's and a treasure hunt route, back to Saint Mawes. This year's theme was a 1960s theme, with the car rally plates in psychedelic colours of bright pink and yellow. Previous years have been centred round the Art of Cornwall, the Food of Cornwall, and the Hidden Places, which involved a fascinating visit to a long since abandoned tin mine. This year we drove on roads, overlooking some of the most spectacular scenery on the coast and hillsides of Southern Cornwell, as well as visits to the Eden Project and Treghrehan Garden, with a driving challenge, the only competitive event.This was won by Sue Murphy, in an Austin Healey 3000. The final afternoon involved a visit to the beautiful gardens at Caerhays, and then lunch set outside, at the Knightor Vineyard, sampling their wine and delicious food,under a Mediterranean blue sky and sun. That afternoon the Concours took place on the quayside, and it was joined by several cars owned by the locals. Judging of the cars was by Johnathan of Bonhams, whilst drinks were served to a packed quayside, as people crowding round assembled cars. Amelia Whitaker had arranged some music, and had made the event into a festive treat with a great atmosphere. Amelia Whitaker, is an energetic and a great ideas person.She is highly motivated, and has some innovative ideas, not only for the rally but for Saint Mawes itself. Amelia and Tim organise swimming, sailing and cycling races around the area, and head the sailing club, as well as run a small guest hotel, known for its attention to detail and excellent service. One of her ideas is to land a four engine seaplane in the bay, in order that the rally can visit this aircraft from the 30s!! The overall winner of the Concours d'Elegance was Charles and Averil Good's Bentley 3 1/2 Litre, as well as a class award for their 7 Litre AC Cobra. Other class awards went to the Jaguar FHC XK 120 of Philip Salt, and the Porsche 911 Turbo S, of Anthony Pozner. Finally to quote Tim and Amelia Whitaker's welcome for the entrants for this Rally.